Recently the paintings of Hilma af Klint have been on exhibition at the Guggenheim Museum in New York, revealing the Swedish artist as a, possibly the, pioneer of abstraction in modern art. Heretofore, af Klint has been not unknown but her reputation has definitely flown under the radar. Her international debut took place in 1986, forty-two years after her death, in a group exhibition The Spiritual in Art at the Los Angeles County Museum of Art. 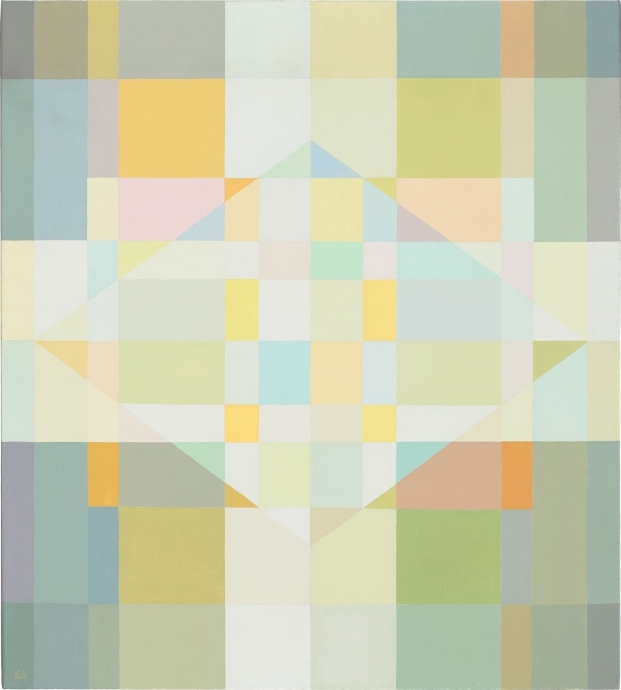 Just as we can look at her work with fresh eyes, so we may be ready to see the geometric abstractions of American artist Edna Andrade (1917-2008) as more than a soft version of Op Art. The similarities between the two artists are hard to miss. While af Klint found in geometric forms, such as the golden mean and the Fibonacci spiral, evidence of an esoteric divine cosmology, Andrade came to use mathematical proportions in her work as emblems of rhythms in nature. Various symbolisms may be attached by viewers to the orbiting moons in Ahmet Hello and the cross at the center of Space Frame (at left). They are, of course, commonly used signs in many different cultures. However the impact of the paintings is related to their size; af Klint's canvases typically tower over viewers whereas Andrade's square images are typically 50 x 50 inches and the rectangles are similarly sized. Bold describes af Klint's intent while Andrade's works invite a more intimate experience. Op Art burst into the limelight with the Museum of Modern Art's 1965 exhibition "The Responsive Eye." Andrade was not one of the artists included in the reputation-making show. Nevertheless, dealers began to take an interest in her work. 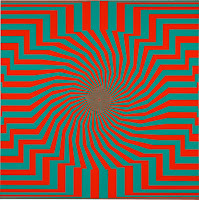 Andrade later said of the name Op Art: "It's too simple. It seems to refer too directly to the physiology of the eyes. 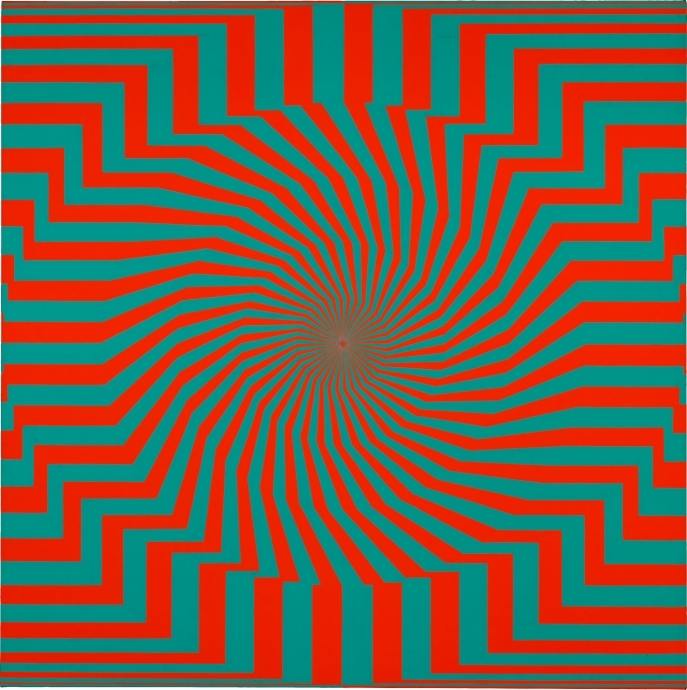 It fails to suggest that we are exploring the whole process of perception." 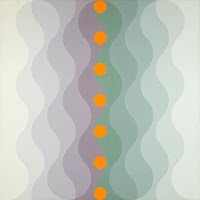 Andrade's geometric works emanate a serenity that suggests motion and stillness at the same time. This could describe the dynamic that is visible in a bridge so it is an apt comparison for the art of the daughter of a civil engineer. There is more to see than dizzying kinetic energy, although she could do that too. Andrade said that she turned to abstract painting for the homeliest of reasons. She was married and teaching school which left her with short periods of time to work on her art. By working with grids she was able to create a pattern that she could then work on in small amounts as time permitted. Andrade compared her way of painting to the traditional arts women have practiced is sexist societies such as knitting and needlepoint. In the 1970s Andrade exhibited with Joyce Kozloff and Miriam Schapiro, two artists who worked with Pattern & Decoration, a movement that celebrated arts traditionally practiced by women. Read more about Edna Andrade at Locks Gallery. 1. 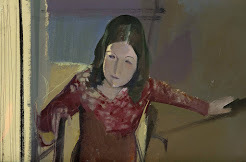 Edna Andrade - Ahmet Hello, 1967, oil on linen, Locks Gallery, Philadelphia. 2. 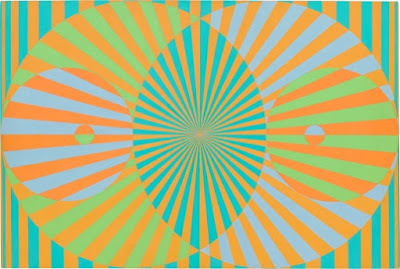 Edna Andrade - Space Dream, 1970, acrylic on canvas, Locks Gallery, Philadelphia. 3. Edna Andrade - Turbo - I-65, 1965, oil on canvas, Locks Gallery, Philadelphia. I didn’t know any of those two artists, thank you for that very interesting note and links. I hope to admire one day their works in an exhibition. There are so many accomplished female artists that we never learned about in art history courses.